Norwegian artist Edvard Munch's hauntingly introspective works heralded one of the most important artistic movements of the 20th century, Expressionism. 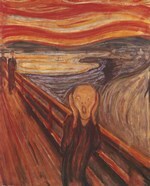 Munch was born in what is now Oslo and, after his mother died of tuberculosis in 1868, was raised by his father. His father's mental illness profoundly affected Munch and the deeply personal statements of his paintings echoed his troubled life: "Sickness, insanity and death were the angels that surrounded my cradle and they have followed me throughout my life." 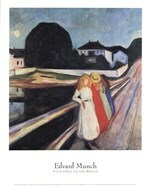 Munch began his studies in 1881 at the Royal School of Design of Kristiania (later Oslo). In 1885 the artist traveled to Paris where he first encountered the Impressionist and Post-Impressionist works of Manet and Cezanne. While stylistically influenced by the Post-Impressionists, Munch's subject matter is Symbolist in content, depicting a state of mind rather than an external reality. During his career Munch traveled between Norway, Paris and Berlin and was a prominent member of avant-garde circles in each locale. At the turn of the century, while in Berlin, Munch began experimenting with a variety of new mediums, including photography, color lithography and woodcuts, in many instances re-working his older imagery. During the Nazi era, his works were labeled "degenerate art" and were removed from German museums. A tremendously prolific artist and one of the most influential of the period, Munch's probing controversial psychological imagery continues to captivate modern audiences.